Debated long and hard whether to stay with him on top, and with so many lightly raced horses dominating the Derby lists, I decided to stay old school and go with the more experienced, battle-tested horse, who also worked old school, breezing an easy mile in 1:46 at Calder. You don’t see works like that anymore. He has so much more foundation than the others, and that’s kind of refreshing in a way. He has a decent amount of stamina through his sire and broodmare’s family, but the only concern is his speed-oriented tail-female family, which is why I like the long, easy mile work over the deeper Calder strip. He will spend Easter weekend putting all his eggs in one basket. And he’ll have to fill the basket with enough points to move on to Louisville. There is no doubting he is the now horse, and from a visual standpoint, he overwhelms and intimidates his opponents with his physical presence and humongous stride. Java’s War and Falling Sky looked like yearlings running next to a 5-year-old stud horse. The Tampa Derby was a big step forward, but can his freaky talent overcome his inexperience? If he’s going to carry his high cruising speed 1 1/4 miles it likely will be due to his fourth dam, the King Ranch-bred Remedia, who is by Dr. Fager, arguably the fastest horse in history to successfully carry his speed 10 furlongs, out of champion European filly Monade, winner of the English Oaks and second in the Arc de Triomphe. Monade is a half-sister to Miss Dan, who finished third in the Arc behind Sassafras and Nijinsky and second in the D.C. International behind Horse of the Year Fort Marcy. Remedia is the dam of Maskette winner and Alabama runner-up Too Chic, who produced Verrazano’s second dam, Ashland winner Chic Shirine, and champion older mare Queena, winner of the Ruffian, Maskette, and Ballerina. Remedia also produced Beat, the dam of Rising Moon, a stakes winner at 1 1/2 miles who placed in the 1 1/4-mile Suburban twice and 1 1/2-mile Brooklyn. Breezed five furlongs in 1:01 2/5, and will be heading for the Louisiana Derby, which would give him five weeks to the Kentucky Derby. This colt has had only one clean trip in five career starts and annihilated his opponents by 8 1/2 lengths going a flat mile, earning a lofty 102 Beyer Speed figure. He has the foundation, he’s demonstrated his doggedness and will to win, his speed over a distance of ground, and he has a dynamite female family. And remember, he was able to do what he did in the Withers coming off only one half-mile breeze in five weeks and no works in 13 days leading up to the race. You have to like a horse who can get fit off his gallops alone. There’s not a lot to pick apart with him. Had his first work since the Fountain of Youth, breezing a half in :48 2/5 at Payson Park. There isn’t much more to say about him than what was said last week. He is another one for the old-school traditionalists to root for, having the foundation , the trainer, and the female family. He is a homebred, which I always like to see. And most of all, he’s probably shown as much improvement race to race than any 3-year-old on the Derby trail. If there is one thing you can count on, it’s that Shug will have him peaking on the first Saturday I May. So, which Vyjack are we going to see in the Wood Memorial? Can the stretch-running Vyjack outclose Normandy Invasion? Can the pace-pressing Vyack handle Verrazano? Assuming Verrazano does indeed run at the Big A, he’ll get his big class test, and so far, by all indications, he should be able to handle it. There is something about an undefeated horse, especially one with his versatility that makes for a more exciting Derby trail. And when you can blow by horses the way he did in the Gotham and then quickly draw off with long, powerful strides, you’re going to command an awful lot of respect. If you were going to play a horse in the future book or Future Wager based on how gratifying it would be to see him win and pay a good price, this would be the horse to bet. Not too long ago, he was considered a budding superstar, having won the Hopeful and Champagne. In the second Future Wager pool, he is the seventh favorite among the individual betting interests at 16-1. It is apparent that his head score in the BC Juvenile and slow closing fractions are being held against him, along with his first career defeat in the Holy Bull, and the notion he can’t get the mile and a quarter. All this may be justified, but the truth is, he ran a terrific race in the Holy Bull, breaking the track record in defeat and finished 11 ½ lengths ahead of the third horse. Can anyone say overlay? Visually, his San Felipe victory was very impressive, especially coming off only two six-furlong races, and you have to love the way this gelding explodes on a dime in the last sixteenth, whether it’s sprinting or two turns. But because of the pace meltdown (:45 3/5 first half and :49 2/5 next half) and having only three career starts and only one two-turn race, I’d like to give him one more race before evaluating him as a Derby horse. Also, as much ground as he was making up, there was another horse closing just as fast from 16 lengths back on the far turn. In the fourth quarter, run in :25 3/5, he lost a half-length, while Tiz a Minister made up nine lengths. To his credit, however, he did out-close Tiz a Minister after getting nearly headed in the final sixteenth. Happy to see Hollendorfer, one of my favorite trainers, back on the Derby trail. It wasn’t the defeat in the San Felipe that was unfortunate as much as the race not helping him move forward professionally. He looked to be in a great position settling in fourth on the inside when Leparoux, perhaps afraid of getting trapped, steered him out and right into an unwanted dogfight. Instead of rating nicely and saving ground, he now was engaged with a speed horse inside him, and to make it worse, his sudden move got Goldencents, who was trying to be rated, all fired up. Once these two eyeballed each other and got their blood up, it was a suicide mission from there on. To his credit, he put Goldencents away, but you could see him shortening stride, and his slow final five-sixteenths set it up for the closers. The good news is that he was beaten only a half-length. The bad news is that he failed to get what he needed mentally out of the race and we still don’t know how ratable he is. After running nearly 7 points faster than his previous best Thoro-Graph number, winning the LeComte by 11 1/2 lengths, one would naturally think he regressed, finishing fourth in the Risen Star. But the fact is, he ran a ‘2’ in both races, which is one of the faster figs by a 3-year-old this year. When they pair up like that, it would lead one to believe that the first one was no fluke. Lukas didn’t pick an easy spot, running him in what is expected to be a huge field in the Rebel Stakes, where everyone will be point hunting and post position will be important. But if he draws a decent post, he does have the tactical speed to avoid traffic. He just can’t make an early move like he did in the Risen Star. He turned in a solid 6-furlongs breeze in 1:13 4/5. Unlike Oxbow, he will return to Fair Grounds for the Louisiana Derby, where he should be much tighter and fitter than he was for the Risen Star. He loses Rosie Napravnik to Shanghai Bobby in the Florida Derby, but gets Edgar Prado, who has made a big comeback and is hot right now in stakes races, riding some classy Pletcher horses. It wasn’t that long ago that Prado was one of the main go-to riders in the country. I still feel this colt, who breezed a half in :49 2/5, has tremendous room for improvement following his first two-turn race and having only one sprint race in 5 1/2 months. He also has a strong pedigree and should only keep improving as the distances stretch out. 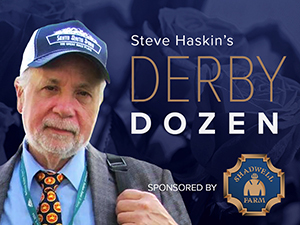 Breezed a half in :48 for his all or nothing attempt to make the Derby cut in the Wood Memorial. He will have to contend not only with his competition, which could include Verrazano, but a likely big field, and then hope he doesn’t encounter the kind of trip he had in the Risen Star, which was enough to shut him out in the points race. It’s going to be a pressure-packed time for the colt’s connections, but if he runs first or second and manages to get in the Derby, it will mean he was flying at the end, and that will make him a major contender, even though there are some question marks in his pedigree. If he does make a big run at the end and gets beat two noses, chances are slim that 24 points will get him in, but who really knows for sure what the cutoff will be. Worked five furlongs in :59 4/5 in company with Den’s Legacy, who will accompany him to Oaklawn for the Rebel. This time it’s not going to be an easy stroll on the lead if Delhomme and Oxbow have anything to say about it, not to mention a full field intent on preventing another Baffert theft at Oaklawn. And hopefully, we’ll get a fast track this time. This colt continues to surprise Baffert, who keeps waiting for him to hit his distance limit. But he’s been re-breaking and kicking in and forcing Baffert to keep going on the Derby trail. But it’s a long way from 1 1/16 miles to 1 1/4 miles, or even 1 1/8 miles. Just ask Secret Circle and The Factor. Here’s the deal with Tampa Derby runner-up JAVA’S WAR. If he runs in the Blue Grass, he moves into the Top 12. If he ships to Dubai for the UAE Derby, he doesn’t. He could very easily win the $2 million prize, but it would seem to be asking too much of him to fly halfway around the world to compete on a demanding Tapeta surface and then fly all the way back home and run in the Derby. If it usually takes older horses several months to get over such a trip, how is he going to run back five weeks later at Churchill Downs? What I loved about his performance was the way he was able to sustain such a powerful move for almost five furlongs over a testing surface and show no signs of slowing down. He’s already run big on turf and Polytrack, and it has to be extremely encouraging to see him run so well on dirt. His dam, Java, is a full-sister to female grass champion Fiji, winner of the Yellow Ribbon, Gamely, and Santa Barbara among others. His third dam, Careless Vision is a half-sister to the top-class Cacoethes, winner of the Turf Classic and placed in the English Derby, King George VI and Queen Elizabeth Stakes, Juddmonte International, and Japan Cup. She also is a half-sister to Santa Anita Oaks (then Santa Susana) winner Fabulous Notion and Not So Careless, dam of Subordination, winner of the Hollywood Derby, Eddie Read, and Brooklyn Handicap. Kenny McPeek is as sharp as they come and he has an enviable choice. If anyone can get the horse to perform well in both the UAE Derby and Kentucky Derby it is McPeek. But it’s never been done before and traveling that far back and forth just seems too difficult to accomplish. Now, if he runs in the Blue Grass, that’s a totally different matter and he certainly would have to be considered a major Derby threat. The other big losing stakes effort was the powerful stretch run from the clouds by TIZ A MINISTER, who proved his explosive victory in the Cal Breeders Championship was no fluke, as he rallied from 18 lengths back early to finish third in the San Felipe, beaten a length. The son of Minister’s Wild Cat has now run two monster races on the dirt after eight starts over grass and synthetic. In the Cal Breeders, he closed from 17 lengths back to win going away for trainer Paul Aguirre. Here is a $6,500 2-year-old purchase at Barretts by a stallion who stands for $4,000. To add to the rags to riches story, he was claimed for $40,000 in his second start. He looks to be an exciting addition to the Derby trail. The Tampa Derby and San Felipe weren’t the only productive stakes on Saturday. In the 1 1/8-mile Private Terms Stakes at Laurel, the Pulpit colt MR. PALMER, trained by Bill Mott, circled the field seven wide and then mowed down his opposition, drawing off to a 3 1/2-length victory at the 9-5 favorite. It took Mr. Palmer six starts to break his maiden, but his performances and his Beyer figs have steadily climbed with each race and there is little doubt he is a colt on the rise. There were some pretty decent horses in the field of nine and he just ran right by them. Now we’ll just have to wait to see if Mott starts thinking Derby. So, where is VERRAZANO going to run next?” That is the question all trainers desperately searching for points were asking. If you need to finish first or second in your final prep, do you really want to go up against this guy? Watch a mass exodus from the race in which he does show up. Pletcher mentioned the Florida Derby, Wood Memorial, and Arkansas Derby as possibilities, but is leaning heavily toward the Wood. Here are the questions facing him. Does he really want to run Verrazano against Shanghai Bobby in the Florida Derby when the latter still needs points to get in the Derby? Considering Pletcher normally likes four to five weeks between races, does he want to run Verrazano three weeks before the Kentucky Derby in the Arkansas Derby? That leaves the Wood Memorial as the logical choice, which is why Pletcher is leaning in that direction. As of now, Pletcher could have Overanalyze going to the Sunland Park Derby. Remember, he could have at least Delhomme in the Arkansas Derby if he runs well in the Rebel, and Capo Bastone has been redirected to the Spiral Stakes. The four weeks between the Wood and the Derby would seem to be perfect, and even though there is always the weather to consider, it is just as likely to rain in Florida and Arkansas as it is in New York. So, just putting everything together, it would seem as if the Wood is the most logical race, Verrazano did grab a quarter when he stumbled slightly coming out of the gate, but it is very minor and is of no concern to Pletcher. RYDILLUC, who I’m extremely high on, will now make his next start in the Blue Grass Stakes instead of the Spiral. I’m not crazy about having to rely on finishing one-two in a Keeneland Polytrack race with a large field, and then hope he handles the dirt on Derby Day, but if he’s as good as he’s looked in his last three races, who knows what he’s capable of. GROUND TRANSPORT, who could be a real sleeper in the Louisiana Derby, breezed a bullet half-mile in 47 flat at Fair Grounds. UNCAPTURED continues to progress beautifully at the Ocala Training Center, breezing five furlongs in 1:00, following a :59 4/5 work the week before. Because of his physical setbacks he now is forced to take the Spiral – Blue Grass route. He’s run big on dirt and synthetic, so the surface should not be a problem. Speaking of the Spiral, CROP REPORT returned to the work tab with an easy half-mile breeze in :53 1/5. Eddie Plesa sent SPEAK LOGISTICS a half in :49 2/5. ALWAYS IN A TIZ worked a half in :48 3/5 with Calvin Borel aboard and with blinkers on for Saturday’s Rebel Stakes. Also working for the Rebel was TEXAS BLING, who went five-eighths in 1:01. Looking forward to seeing Derby longshot special TREASURY BILL stretch out in the Rebel, but it’s going to be a tough assignment with such a large field and a number of talented horses. A first or second here and he will shoot right up the Top 12 list.